Martina “Marty” Hart is really nice. At least, that’s what people think. It’s Marty’s junior year at Minster High. Minster’s a small town where making great grades, smiling pretty, helping old people, running the new-student Welcoming Committee, and putting up decorations for all the dances–including the totally awful Hot Shot fall hunting celebration–gets you … what? Marty’s not sure. Instead of dreaming about a sororities-and-frats future at nearby University of Michigan, she’s restless, searching for a way out of the box her controlling mother and best frenemy Sarah have locked her in. When Lil–don’t call her Lily!–Hatfield transfers to Minster, Marty gets her chance. Lil’s different. She smokes, wears black, listens to angry punk records, and lives in a weird trailer with her mother. Lil has secrets–secrets that make her a target for all the gossiping and online bullying Minster can muster. But so does Marty. And Marty sees something different in Lil. Something honest. Something real. 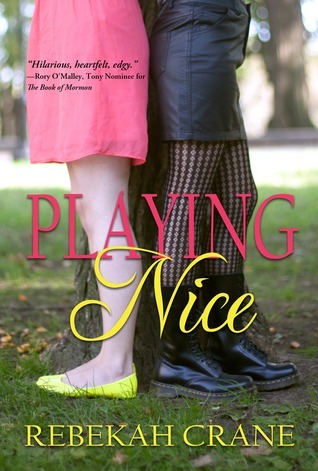 Playing Nice is the achingly real story of a girl who’s been following the rules for so long she’s forgotten who she was when she started. It’s about falling in love with the wrong people and not seeing the right ones, about the moments in life when you step out of line, take a chance … and begin to break free.